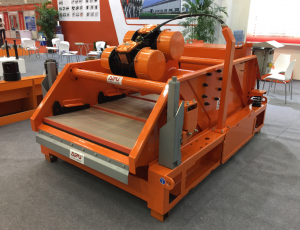 AIPU shale shaker shown in Dongying oil exhibition last week with good feedback. The dual motion shaker is special designed for oil and gas drilling mud treatment for better performance. 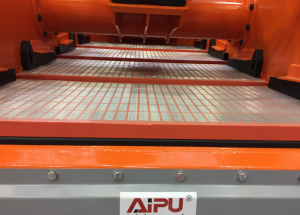 The shaker shown in Dongying and a lot of clients visited the shaker and shown great interest in AIPU shaker as well as other solids control equipment. Dongying oil exhibition is one of the famous exhibition in China and worldwide exhibition in drilling industry. There are many clients from China, India, Rusia, Aisa, Africa, etc come and visited us. AIPU equipment shown on the Dongying TV show in the NEWS. Dual motion shale shaker with 2 sets vibration motors, 1 set various speed motor controlled by shaker electrical control panel, so the shaker can be linear motor or elliptical motion. Martin or Itvibras or Oli motor installed, IECEX or ATEX standard electricals can be supplied. The control panel is same standard with motor to suit client request. High strength materiel shaker deck heat treated for high G vibrating resistant. The G force can be 6.0 to 7.5 depending on G force adjust. Shaker skid is carbon steel material install deck angle adjust system and allow shaker deck -1 to +5℃ adjust. Mechanical adjust help shaker deck flexible and convenient deck angle adjust.